When the Germans encountered the thick armour of Matildas at Arras, they lowered their 88 mm FlaK guns and used them to engage the British tanks. When faced with the Tiger's thick armour, the Soviets did the same. The AA gun chosen for this task was the 85 mm anti-aircraft gun model 1939. Let's see how well it worked against a Tiger. "Target: side. Distance: 800 m. Result: penetration, breach size 350 mm by 230 mm. Target: side. Distance: 1450 m. Result: penetration, breach entrance diameter 110 mm, exit diameter 380 mm. A fragment 700 mm by 92 mm by 82 mm was knocked off. Cracks 220 mm, 200 mm, and 180 mm in length developed." Some pretty catastrophic spalling going on here. Recall that the T-34-76 had to close in to 500 meters to even have a chance of damaging a Tiger tank, even from the side. "Target: side. Distance: 1450 meters. Result: penetration, breach diameter 115 mm. Target: lower front. Distance: 1000 meters. Result: penetration. Entrance diameter 150 mm, exit diameter 160 mm. An armour fragment 230 mm in diameter broke off on the inside. Three cracks, 300 mm long, developed. The welding seam is destroyed." More catastrophic spalling, this time in the front. More welding seams giving in under pressure. The testers then got optimistic, and moved out to 1500 meters. "Target: upper front. Distance: 1500 meters. Result: dent 30 mm deep, 120 mm in diameter. Bump on the inside. Target: lower front. Distance: 1500 meters. Result: the plate cracked from previous impacts by the 85 mm gun. Two pieces broke off: 500 mm by 240 mm and 800 mm by 200 mm." The Tiger's overhardened armour cracks and falls apart after two hits to the lower front plate. A bit disappointing for a tank that has been made out to be invincible. "Conclusion: the armour piercing shell can penetrate the side of the Tiger tank, 82 mm thick, from 1500 meters, and the front, 100 mm thick, from 1000 meters." These are certainly some excellent results. 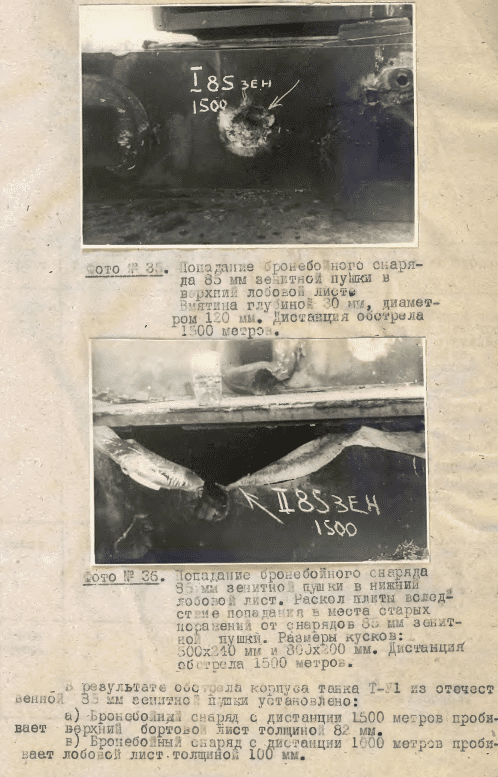 They appear to be confirmed in practice, since a Red Army document on tactics of Tiger combat notes that it can be penetrated from the front at 1000 meters, and from the side at 1450 meters. It is not surprising that an 85 mm gun with similar ballistics was placed first in the SU-85, then in a T-34, to make a dangerous enemy for any German tank. Now, let's take a look at tests against the Tiger II. The D-5 gun is used in these, mounted on the SU-85 tank destroyer. "Shot # 22. Target: upper front plate. Distance: 300 m. Result: dent, 200 mm by 125 mm, 50 mm deep (including remains of the shell that welded itself to the armour). A fragment broke off the other side of the armour, 300 mm by 250 mm, 85 mm thick." As with a lot of shots at the Tiger II, even when the shell does not penetrate, the spalling takes care of the crew and internal components anyway. turret side from 800-1000 meters"
A T-34-85 fought several Tiger IIs from the s.Pz.Abt 501 at Ogledow. There were supposed to be 45 of these new tanks, but only 8 made the 45 km march. Oskin's T-34-85 destroyed 3 of the Tiger IIs in that battle. One of the tanks that was captured at Ogledow intact was the one that served as a test subject in the Tiger II penetration report. Yes good point, but invalid. Note the distances, frontal penetration at a kilometre away, the Tiger crew would not know where the enemy was until the first shot, at which point they could take an educated guess depending on what part of the tank got hit. Even less likely that they could angle their armour to an enemy 1.35 metres away, especially if advancing. I meant 1.35 miles away... oops. The positioning of the tank happens before the first defensive shot is fired. They only get shots at the side armor after the tank has penetrated deep into the defensive formation. That is why there are Tigers and photos with dozens of non-effective hits on them. The many projectile ricocheting off with out interior effect, or spalling at all. I wish I could remember where I saw the one with almost 40 hits that was abandoned intact after running out of gas? This adds nothing to the discussion. They were 40 85mm hits? 37mm? Or even 14.5mm ones? AP or HE? What was the distance? The Tiger, being on the defensive most of the war, and having superior tactical awareness/visibility, will likely see the T34/85 first. It's the others that will get the Tiger. But even then the angle is rarely 0 degrees. Either horizontal or vertical. But the 85mm was effective enough. it also seems that any tank with many many rounds fired into it is going to suffer a breakdown of armor. In normal battle conditions, a tank usually does not have so many 90 degree solid hits. While the tests are faulty, they did what you should do against tanks - shoot at it until it burns or breaks apart. Is it possible to have a link/download for the whole report? this is a picture of kubinka test to king tiger turret, shot #25 is from king tigers own cannon. it penetrated turret totally, from front to back. only gun which was able to do that..
poor russkies..look, your equipment was cheap and inferior, but you produced a lot of it...so, you won.period. Trannys don't apply to conversation about Russian tanks, period. then maybe have a teaspoon of cement and toughen the hell up? Betty, inferior equipment compared with what? Compare it with Brit and Yankee equipment, you will see which is inferior. If you want to compare it to German equipment, explain me why Germans avoided to expose their big kitties to Soviet heavy armored forces if they could. Soviet equipment was much cheaper, simple and more effective due to better planification and adjustment to requirements. After so much years it's amazing how tough could the propaganda be. I'm refering to the big kitties of 1944-45. I'd like to see a similar report of the 85 mm's performance vs a captured Panther. Notice that all penetrations are at fairly long range = lower impact velocities. This is quite significant due to the use of uncapped, soft and low alloyed AP projectile steel which couldn´t be hardened to the levels required to withstand high impact velocity stress. The higher velocity 57mm could penetrate 82mm at long range, too, but failed to perforate 100mm at close range, where You´d expect it to penetrate much more. Thus, the soviet preference of increasing the calibre of gun (85mm instead of 57mm) appears to be a rational one, taking into account the fact that choices of projectile technology was lacking requirements to extract optimum performance. The Soviet 57 mm gun performed better than the British 6-pdr of the same caliber. Was their technology lacking too? The data reproduced here is from actual firing trials conducted during ww2 and was tabulated under "Comparison of thickness of plate perforated by full calibre and sub-calibre projectiles", p.68 SUPP 6/910 "The penetration of armour plate" (1950), originally classified as SECRET (declassified 1981). In Soviet trials, the ZiS-2 reliably penetrates the side of a Tiger at 1000 meters, the 6-pdr does not. The gun performs significantly worse than is claimed by your test. Anonymous take in account British (USA and Germany also) used V50 tests, I don't remember it well what exactly Soviet used, but it was V70 or V80. This means two things, first Soviet used much harder and realistic tests. Second, you can't compare two different test made using different parameters in each one. The criterium of penetration by definition in the 1950 british primary source was W/R complete penetration 50% probability criterium as used by the UK in late war contexts. This is comparable to US Navy ballistic limit. It is, however, not comparable to defintions in place in Germany or the SU. Germany never used a 50% criterium, and I don´t understant why this is going to be repeated here over and over again. The CIOS report "Steel AP and Theory of penetration" disprooves this myth. They used for explorative performance trial and service acceptance proof G(D), a close to 100% ballitic criterium (5 out of 5 successes for the calibre in question at narrow valicty range, no failures allowed), which is the most severe penetration definition used by any nation during ww2. The SU used both, a 20% and 80% criterium. However, if You calculate the mean of (V20+V80)/2 You get the british V50. Comparison thus, is possible. ZIS-2 does penetrate the side of a TIGER-I at 800m, exactly like the 6pdr. Tests at 1000m were not directed against the side of the tank but the commanders cast cupola. However, the ZIS-2 used inferior ammunition, and even while the 6pdr AP-shot was not excellent from the beginning, they subsequently improved the 6pdr APCBC throughout ww2. 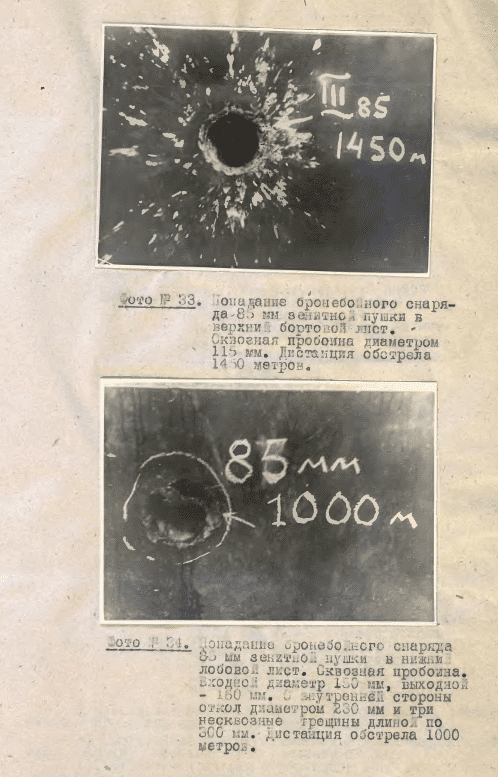 They used higher alloy steel, decremental hardening and improved caps and this allowed for improved penetration compared to the ZIS-2, particularely at shorter range /high muzzle velocity, where the 6pdr was superior to the ZIS-57 at virtually all obliquities. The performance at 800m was indifferent between both, as both perforated the TIGERs side but this doesn´t tell You anything about the problems encountered through shatter at elevated impact velocity close. ZIS-2 should be expected to completely perforate TIGER I front at close range with APC of average quality or even specially made, high alloyed AP but they failed because of inferior, uncapped, low alloyed and consequently soft projectiles which happened to strike beyond the velocity at which the projectile start to noticably deform. 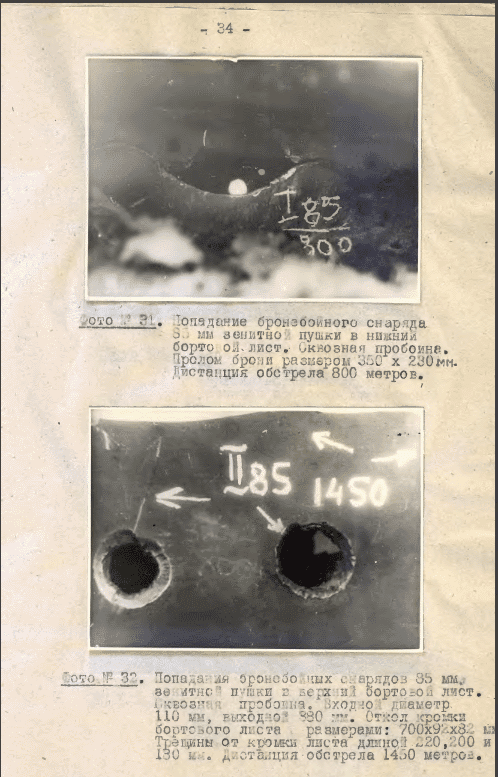 The problem is a general one for soviet ww2 AP projectiles as they were dismissive to the idea to shift to higher alloyed steel for projectiles and to cap them with armour piercing cap. There is nothing wrong with this rational but it predetermines to embark on a developmental trajectory favouring larger calibre, lower velocity gun systems over medium calibre, higher velocity gun systems. Just a suggestion. Given the nature of the Soviet regime and their reputation for emphasis on propaganda value, even at the cost of lives and property, could their test results not be false? Propaganda doesn't go in a box to gather dust for 70 years. Everything from the soviet empire was propaganda, so your point is moot. There are zero accurate statistics on casualties or production. The entire regime was a meme and these tests are probably fake or dishonest as field combat shows the gross inferiority of the Red Army. Your blog nakedly propaganda by having Soviet imagery and "70 years of victory." That was a communist meme. The USSR won because the US gave them infinite supplies and materiel. Boris Sokolov proved it. Do you want to know what is propaganda? The way the information about the lend lease program is given. They give absolute numbers, never relative ones, neither an estimation. Nobody complains about it, but when somebody works translating the best information released in decades and that colides with our propaganda filled brain we just complain about it instead of contrasting and trying to tie all the knots. That is a sectarian type of mindness which is the worst type of mindness in a human. I'm having a bad day and felt like shitposting. everything soviet however, is suspect at best. Its not the best information. Information from the USSR should always considered suspect. What's sectarian are Tankies who love to claim the USSR would have won by itself no matter what. That's probbaly why they had their forces amassed on the border suspiciously before Hitler invaded. Now, I should not be so unfair. It may be that these tests are not propaganda. But I suspect they might by 'accidentally' biased to please Stalin. The USSR had plenty of good ideas behind their equipment. But their construction was shoddy. Other sources and field reports usually show poorer combat performance than there should have been given the design. That might be in part the inexperience of Soviet tankers, since so many were lost in 41, and a good number after that. Replacements probably did not have the mathmatical skills that the crews they were replacing had. Now, Germany equipment, was surprising light. The idea that they were the most mechanized, is largely untrue. The British were the most Mechanized. I'm not sure how mechanized the USSR would be rated in the amount of mechanization but it was clearly near the top. I cannot authoritatively comment on the validity of these tests. I should not be so brash, but if I were to write a paper I wouldn't use this blog's translations as authoritative. I mean surprisingly light relative to 1939-41. They did improve thereafter. But in general, the USSR had heavier equipment. France did in 1940. I had a similar view of the subject of yours some time ago, German is completely trusfull Soviet not. But after thinking a bit about some subjects I started to change my mind. One of them was if the Soviet were so bad and the Nazies so good and the Soviet suffered so many defeat and casualties, how did they win the war? I looked to the casualty rates and it was a magnitude lower than I expected. This made me suspect, I started to look for information and I found this blog. The author is Rusophile, he doesn't hide it, you can see it in the first second you enter this blog. But the information he gives is the best you can find about the Soviet front, only comparable to German secret documents and far much better than any memories book written by anybody. There were different secrecy leveks, but most of this information was secret even for most of the Soviet officers of the era. This information was secret until the Soviet Union collapsed, we don't know when would it become public but for now the information we have tells us if the Soviet Union didn't collapse it would still be secret. So forget any progaganda related factor in this information, forget also they wrote it for the eyes of the dictator. Why? Because these informs were way bellow the document the big moustache dictator received, yes there could be a document Stalin would read directly but it would be a hugely specific event. Think in the size of the Red army, add to it the huge amount of documents all the Soviet Union industry, intelligence or even the forecast services created and you will see Stallin didn't live enough to read a fraction of them if he took all gis life to do it. So were dies this bring us? We have the perfect tool to compare with German documents and reach some strong conclussions. Like the Nazi documents have at least the same level of trustness of the Soviet. In my case looking at the documents the author of this blog and a Spanish military study center has compared the German documents of 1944-1945 and those related to fancy name units are unreliable. Take in account Spanish military related people tends to be clearly Germanophile. That tank destroyer who destroyed 11 (if I remember it correctly) enemy tanks in a day were all of them were sent to the reserve is a clear evidence of this. Can it be inaccuracies or wrong information in these documents? Clearly yes, but be sure they will be in the same way you can find them in any other documents of this class. But looking at hiw we the occidental people have been adoctrinated about this subject we have a huge amount of information to work in and learn in these documents. Sorry for the typos, it's late here and I'm tired. 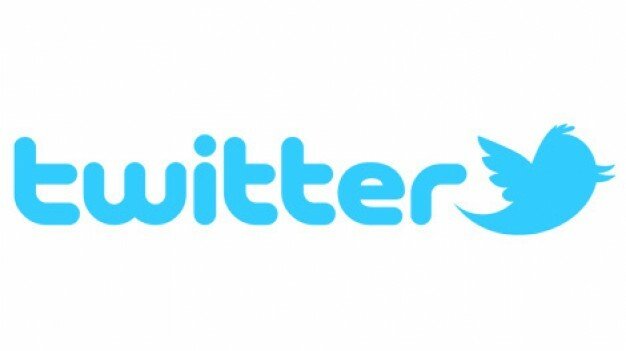 I will briefly respond. My mother is Jewish so.... I'm not really a Germanophile other than their uniforms which I think everyone agrees are very stylish. I don't regard German sources as flawless, but view their bias or inaccuracies are roughly on par with the western allies. Hitler's genocide program doesn't mean he was an insane maniac (at least not till the last few months of the war) like Stalin was. I simply don't believe accurate data from the soviet side exists, including internal data not meant for official propaganda. Communist iconography pisses me off more not because it's "worse" but because they are the ones who won and subsequently ruined Europe. The big moustache dictator was not as maniac (I'm not saying he wasn't) as we are told. He left his subordinate work when he saw he was not doing well and he succeeded. In the other hand the small moustache dictator started do become as maniac as the big one when the war started to change it's path. In my opinion at the end of the war the small moustache dictator was more maniac than the big moustache dictator at the beginning of the war. The same happened with their organizations and this is the reason the Nazi documents lose part of their credibility. False test under Stalin in wartimes? I mean, I feel like it's important to note that when the designers of the SU-76 were found falsifying test results, they were sent straight to the front lines, where they were killed. I think it suffices to say that this would be an adequate method to try and ensure accurate test results. I apologize for writing a rude first post. I can't say I don't have misgivings, but the work you have done no doubt was extensive and has value. Thank you for translating these works. I own 6 different types of Soviet weapons. I have extensively tested each type and personally found that they not only exceed their stated capabilities, but they fully exceed their Western counterparts as weapon systems. At the same time I have identified that the typical Western anti-Russian propaganda came from "Operation Paperclip", when actual Nazi war criminals were extracted from 1945 Nazi Germany and were sent to USA in order to set up propaganda offices and develop weapons. Cold War era American anti-Soviet propaganda was EXCLUSIVELY manufactured by Nazis that were saved by US by Operation Paperclip. Any idea if this was BR 365 or 365K? I think that the BR-365A was more common but the results also match the BR-365K if one uses momentum based penetration. Soviet AP rounds lacked hardness and would easily shatter against thick armor while flat nosed APBC rounds lacked penetration but were easier to produce. Both penetration ranges are rather poor for such high caliber gun. The PaK 40 had the same or lower velocity as the 85mm and would be able to penetrate the front at around the same range and the sides from ~1800m. And that is considering that the harder armor on the Tiger would be more resistant to the 75mm than to the larger and probably blunt 85mm projectile. So the 85mm wasn't really that effective for the caliber. The new T-34-85 negated the larger rounds by having a better crew layout with a bigger turret. So the 85mm didn't suffer any loss in RoF but was still lackluster for taking out a Tiger from the front. The main advantage was that in was now superior to the Pz IV in a 1vs1. Considering that crews often placed tracks at the front armor and that the Tiger 1 never received any armor upgrades like the Pz III and IV, I think it's save to say that a Tigers armor was considered good enough for what it could face on the battlefield between 1942-44. The new Panther F turret was going to be 120mm strong. The only logical reason for this value was that it was enough to stop the 85mm from the T-34-85 which could now penetrate the Panthers 100mm turret.